There was an error with a server migration by our host yesterday that caused some issues with the site. This issue caused the site to appear as if it had rolled back an entire year. This meant that any new content posted on the main page was missing, the downloads pages were old versions, many user galleries were missing, and the site may not have recognized your login info. Unfortunately, this also means that if you logged in yesterday within that period and saved a roster or uploaded photos to your gallery they were not saved to the current version of the site. Fortunately everything should be fixed and back to normal now. If you find rosters or photos missing, you will have to re-upload or save them. I don’t expect there to be any other lingering issues from this, but if you do have any other issues with the site please contact us. Sorry for the inconvenience! In more positive news, I have been playing some of the Warhammer: Invasion LCG and will be putting up a review soon. I may also put up a review of the Lord of the Rings LCG expansion sets as well. 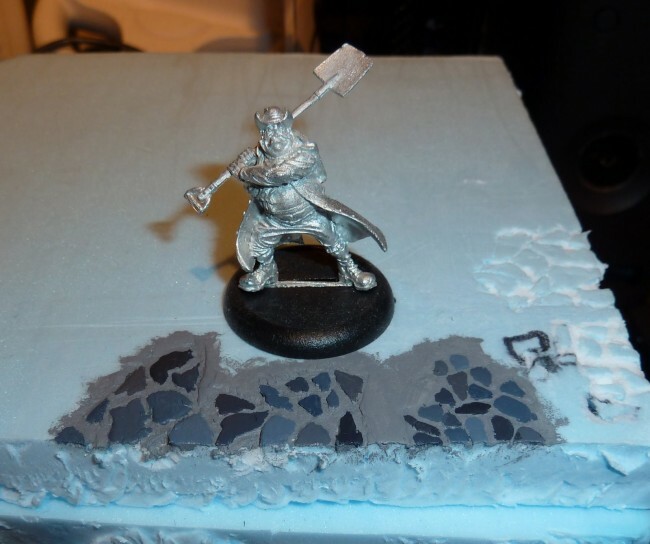 I have also been working on refining the flagstone technique. We have decided not to use the stamp and instead cut out the pattern and fill the grout with lightweight spackle for a more realistic look. I picked up a new hot cutting tool that works great for hand carving the flagstone as well. I will be putting up a full post on this new technique soon, but for now you can see the work in progress shot. This entry was posted	on Tuesday, August 23rd, 2011 at 11:13 am	and is filed under Site News. You can follow any responses to this entry through the RSS 2.0 feed. You can leave a response, or trackback from your own site. Powered by WordPress v 5.1.1. Page in 1.260 seconds.